Political races in the United States rely heavily on highly paid political consultants who carefully curate the images of politicians, advise candidates on polling and analytics, and shape voters’ perceptions through marketing and advertising techniques. More than half of the $6 billion spent in the 2012 election went to consultants who controlled virtually every aspect of the campaigns, from polling, fundraising, and media to more novel techniques of social media and micro-targeting. These consultants play a central role in political campaigns-determining not only how the public sees politicians, but also how politicians see the public. 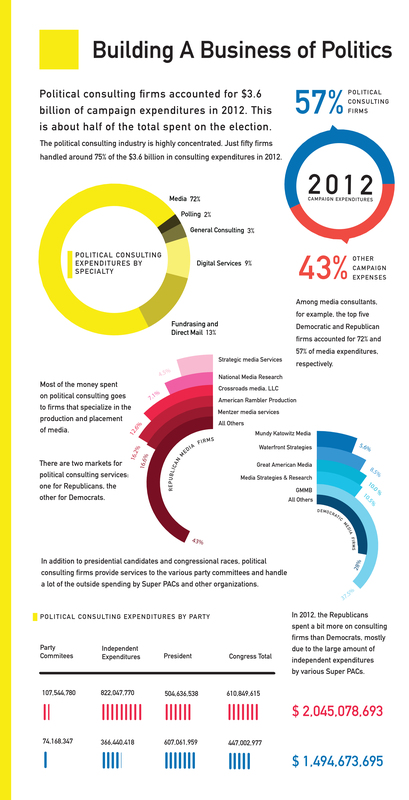 Sanskruta Chakravarthy, a student at the Maryland Institute College of Art, created a beautiful infographic to illustrate the impact of political consultants on campaign expenditures in the 2012 election. Infographic created by Sanskruta Chakravarthy. Used with permission. Featured Image Credit: “USA Industry” by AK Rockefeller. CC BY-SA 2.0 via Flickr. Adam Sheingate is an Associate Professor of Political Science at Johns Hopkins University and author of The Rise of the Agricultural Welfare State (Princeton). 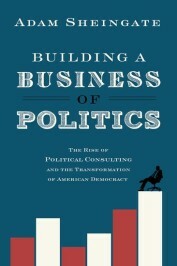 He is also author of the recently published, Building a Business of Politics: The Rise of Political Consulting and the Transformation of American Democracy.